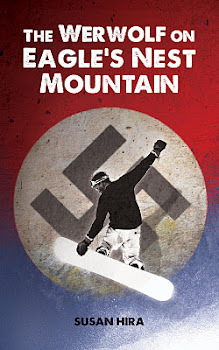 Today I had the wonderful opportunity to interview Susan Hira, she has written an story called The Werewolf on Eagles Nest Mountain a story about some young boys who go on holiday to do some Snowboarding and find themselves in the middle of World War Two! Anyway here is the interview. Thank you Susan for taking the time out to do this interview firstly could you tell us what is your book about? to budget constraints, their new history teacher insisted that the ninth grade winter class trip be held at the Eagle's Nest Mountain Ski and Snowboard Resort, a dilapidated dump with only three lame lifts. When the kids attempt to shred the prime fresh powder in the Arctic Bowl at the top of the mountain, a sniper attacks and forces them to jump from a lift in mid-air. Before the assassin can strike again, the boys decide to investigate and discover a secret lair inside the mountain used to warehouse and redistribute stolen goods. They realize that all clues lead to an elite guerrilla movement started near the end of World War II known as the "Werwolf" organization and the long-lost gold and art plundered by the Nazis during the war. The ringleader of the newly formed gang, a direct descendant of a Hitler Youth Werwolf, is raising money to fund the new regime. Like an assault rifle firing at close range, the boys' beliefs of good versus evil are shattered as they navigate the emotional fallout from those trying to live down the infamy of their ancestors, some with pride, while others with shame. As Nick, Jack, and Mike battle for their lives armed only with skis and snowboards, they must figure out whom to trust--or their electrifying ride down the mountain will be their last. What inspired you to write about World War Two and snowboarding? I wrote this book when I injured my knee snowboarding and had to take a season off to heal. Without snowboarding, I had quite a bit of free time! Also, my father and I always hit the slopes together, so we missed talking and goofing off when I was sidelined. Since we couldn't snowboard together, I thought working on a book would be a good way to still have fun. My father has been studying World War II his entire life, so he served as the historical editor on the book. He gave me plenty of ideas including using Werwolf members as the bad guys. I think we both impressed each other with our contributions to this book and continued to challenge each other through the writing process. Writing the snowboarding/skiing scenes was a blast! I felt like I was on the slopes again; it made missing the snowiest winter in years bearable. Certainly J.D. Dawson the journalist. He’s inappropriate, rude, greedy, and handsome but has a weakness when it comes to love. I really enjoyed writing his newspaper articles. Why did you choose to self publish your book instead of going through a publisher? I didn’t feel I’d have any success getting a publisher since I am a first time author with only minor magazine and technical writing experience. Plus, I didn’t think that they would be receptive to the topic of World War II for the young adult / middle grade age. What do you find most challenging about being a self published author? Are there any authors that have influenced your writing style? My favorite writers / poets are Edgar Allan Poe and Emily Dickinson. However, I’m certainly influenced by the Indiana Jones movie series, Carol Burnett, the cast of In Living Color & I’m Gonna Get You Sucka, The Little Rascals, Casablanca, and the vintage Nancy Drew / Hardy Boys book series. I also find books like Shadow Divers and Deluxe: How Luxury Lost its Luster fascinating. A bit of an odd mixture, but if you read the book, you’ll find seriousness mixed with absurdity. Tell everyone you meet that you’re writing a book. They may have great promotional ideas! This month the manuscript for the sequel to The Werwolf on Eagle’s Nest Mountain goes to an editor for review. This will start the publishing process on that book. I hope it will be in paperback and Kindle e-Book by mid summer. 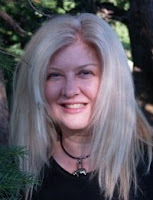 Thank you again Susan for the interview and look into self publishing. Congratulations on successful Crazy Awake! I've observed advantages of it, so I wish you enjoy. Also, those are some amazing guides you got from the collection. The Program and The Cycle are two guides I'm really awaiting. Can't hold out to listen to your ideas.